Face Powder: An absolute essential when working at the airport and for every day life as well. My favorite powder at the moment is the MAC Mineralize powder. I bought it in duty free the last time I came to Mauritius and I've been hooked. One thing I love about this powder is that not only does it come with a mirror but it's good enough to just wear on it's on as it adds a little bit of coverage to your face as well. It's perfect for those days when you're in a rush and don't feel like applying much, I also love using the Rimmel Stay Matte Powder as its just an amazing powder. It's cheap and cheerful but does an amazing job and is just perfect in any make up bag. Perfume/Deodorant: Being a perfume hoarder and a lover of all fragrant things it's an absolute essential to top up when I'm on the go. At the moment I always have a bottle of Victoria Secret Body Spray in my bag. I love this sprays as the bottles are made out of plastic so there's no fear of them smashing around in your bag which is a big bonus. I love spritzing this on throughout the day and I always get complimented on it as well which is always an added bonus. Clear Nail Varnish: This is mainly for work as we have to wear tights that very often end up having ladders running through them. I always apply this to the ladder and it stops them from getting worse. I also love this for reapplying to my nails if they are looking a bit dull looking as well. I just love clear nail polish. Extra Pair Of Tights: I'm sure this one is a bit self explanatory. I always carry an extra pair of tights in my bag just in case something happens and they end up getting a massive hole in them which believe me happens quite regularly. So I always stock up on tights and make sure to keep a pair in my bag as I have had a few run in disasters with them in terms of getting holes in. Face Wipes: My favorite face wipes are by far from the brand Simple. I know there's this thing where people say facewipes are not good for you but from personal experience I've never had a problem with them. I tend to use them more on non make up days to really refresh the skin when I am out and about. My favorite ones to use from simple are the Kind To Skin Micellar wipes as they give your skin more of a cleanse than regular make up wipes. I love them as they are so multi purpose as well. Lip Products: There is no shortage of lip products in my bag ranging from lip balms to lipglosses to lipsticks. The standard lip products that tend to be in my bag are the Nuxe Rev De Miel Lipbalm. I just adore this lip balm so much. It's so moisturizing and really has sorted out my lips for life when it comes to dry skin appearing on them. I also carry my favorite lip butter from Revlon in the shade Berry Smoothie. I just think this is a perfect shade for every day wear and again is very moisturising on the skin. Thermal Spring Skin Water: This has been a god send at the moment. In the UK the weather was getting warmer and I tend to get really warm and my face tends to get quite sweaty. Kinda gross but there you go however to help I use the La Roche Posay thermal spring water and spritz it on my face and it is really cooling and refreshing. I'm also currently in Mauritius (hence the lack of blog posts) and it's not as warm as it was the last time but still warm so again it's just really helpful at those times. Hair Brush/Bobbles: I'm forever brushing my hair during my spare time as it is just so awfully long and hard to manage and sometimes when I just want to get it out of my face I will then use the bobbles to tie my hair up. The amount of bobbles and kirby grips I have at the bottom of my bag is ridiculous, I honestly have enough to open my own shop. Extra Pair Of Headphones: You know those moments when you have a long train journey, go to check your bag to escape from all forms of human contact and shut yourself away from the world a little bit but then realise you have no headphones? Yeah that has happened to me many a time and since then I have bought a pair of headphones and they know have their pride of place in my bag. If I ever forget a pair again all I have to is reach in and remember that I have a pair in my bag. Problem solved. 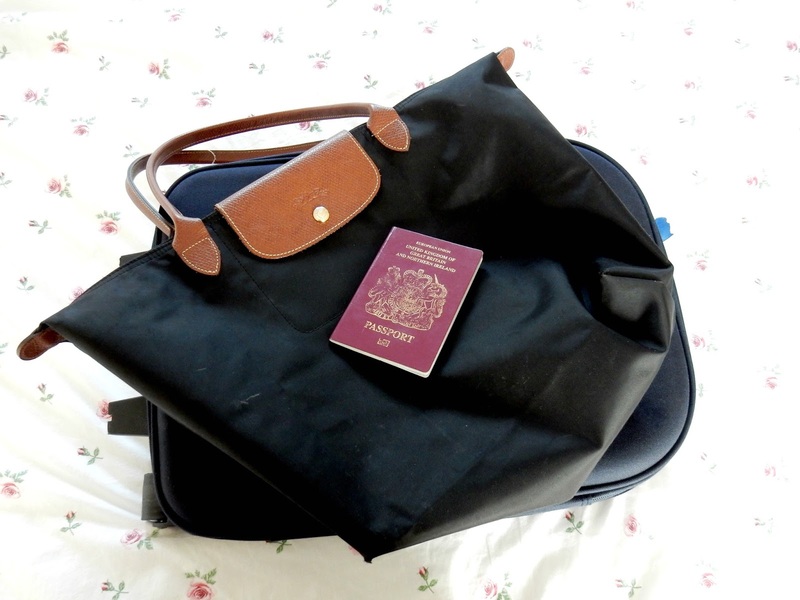 Passport: I don't really like carrying my passport around because I always get scared I'll lose it, however recently I've been planning lots of trips and have needed my passport details for them as well so I now make sure it's always in my bag. When I get home from my trip in Mauritius it'll be going straight back into a travel wallet in my Dad's wardrobe as I know it's safe there. So there we have it just an insight into my handbag and the things that I must carry around with me on a daily basis. I don't have all the products to hand to photograph as I am currently on holiday and things are scattered all over the place at the moment. I will come back at a later time and add the photos in I think but I hope you enjoy this post and let me know below if you have the same things as handbag essentials. Wow ! You carry tons of stuff in your bag . My bag musts are hand cream , lil balm , perfume and hand sanitizer ! I love my longchamps! I recently purchased one in the small tote size to use as an everyday summer purse and as much as I love my neo in the large tote size, it just makes me want to carry around tons of stuff. The smaller size definitely helped me downsize for the warmer weather :) . I cannot leave the house without my phone, mophie charger, nintendo 3ds xl (counts steps), my wallet, and a small toiletry pouch with makeup + feminine products.